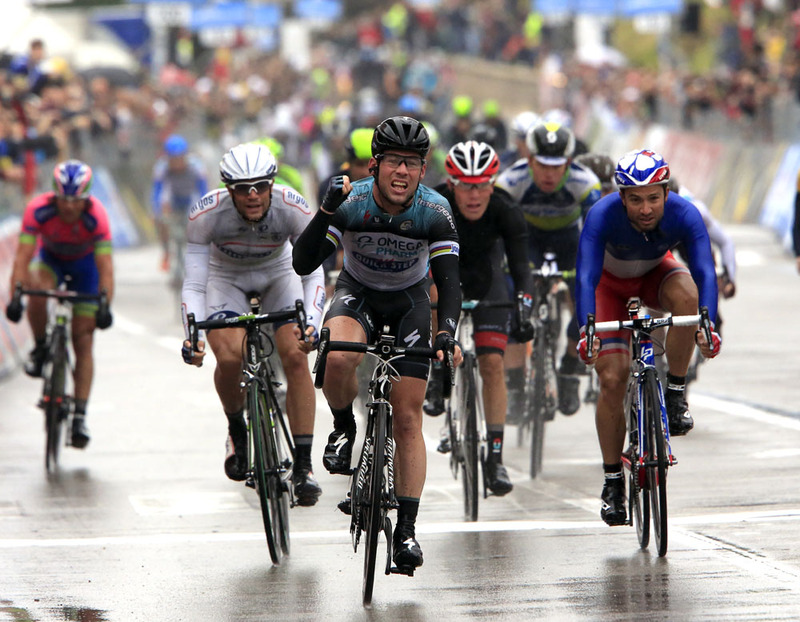 Mark Cavendish (Omega Pharma-Quickstep) won his 100th victory as a professional on a rain soaked and tumultuos day at the Giro d’Italia that saw the overall chances of Bradley Wiggins (Sky) all but disappear on the road to Treviso. A well-drilled chase and leadout from Omega Pharma-Quickstep caught the day’s breakaway with metres to spare and the Manxman duly delivered in a messy sprint ahead of Nacer Bouhanni (FDJ) and Luka Mezgec (Argos-Shimano). Meanwhile Wiggins, reportedly suffering from a cold and struggling once again on the sodden asphalt, lost over three minutes on Vincenzo Nibali (Astana) and Cadel Evans (BMC). Griding a big gear and grimacing into the rain, he lost touch with the pink jersey group inside the final 30km of the shortest stage of this year’s Giro and will surely have waved goodbye to his chances of overall victory, slipping to 13th overall. Nearly all of his Sky teammates dropped back in vain to help with the chase, however Rigoberto Uran crucially kept up with the front group to consolidate third overall and now become Sky’s de facto leader. Talk this morning was of Cavendish’s chance to make it 100 wins as a professional and his Omega Pharma-Quickstep team lived up to expectations, taking control of the three-hour stage, that included two category four climbs, from the gun. The day’s break of Marco Marcato (Vacansoleil-DCM), Maurits Lammertink (Vacansoleil-DCM), Bart De Backer (Argos-Shimano), Maxim Belkov (Katusha) and Fabio Felline (Androni-Venezuela) never achieved more than four minutes, although the quintet did appear to have misread the script as they stayed away until the final few hundred metres. As Cavendish celebrated his 100th win by throwing a t-shirt with ‘100’ on it to the crowd, Wiggins waved goodbye to his chances of victory and the coveted Giro-Tour double. For very different reasons, whether either one of the pair will continue any further in this year’s race after this evening remains to be seen. 10. Francesco Ventoso (Movistar) all at s.t.